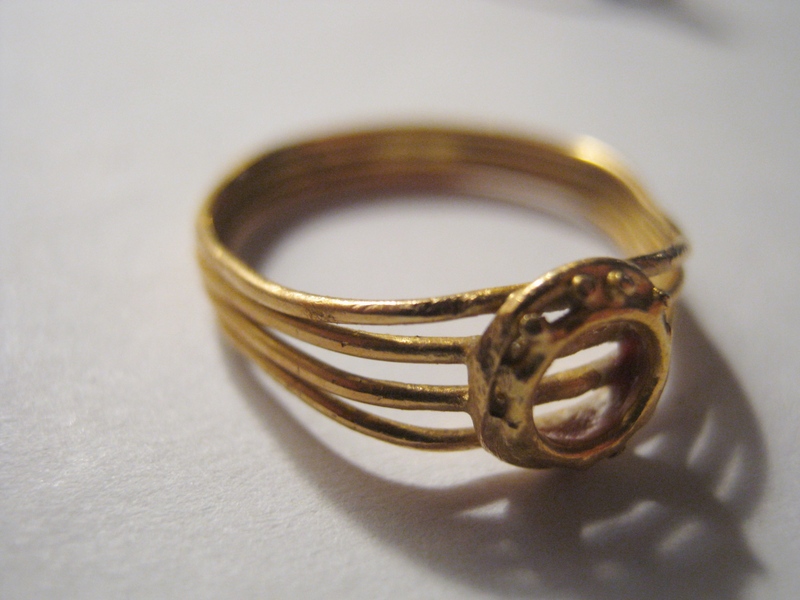 UPDATE (Feb, 2013): The top ring is gold, but the bottom ring is actually gold-plated silver (vermeil). Thanks to an Etsy shopper for letting me know! I haven’t done as much picking in the last few days, as I’ve been a bit under the weather. I did make it out briefly last night, mostly to check out a place that has been putting out good trash for a while now. An old Ukrainian woman passed away a year or so ago, and her daughter now has to sort through all her things, so I’ve been told. The old woman never threw anything out, and for about a month many bags have been left out each week as the sorting continues. Yesterday I looked through what is looking more and more like the last remnants of the stuff inside. Because of what I found here before I have been very meticulous when looking through the stuff. I found a few bits and bobs, most of which I left on the curb near my place for others to take (and most of which have since disappeared). I also found these old rings, which I suspect could be gold. They were at the bottom of the bag, clearly swept up off the floor with other dust and dirt. I’m not sure what to make of this symbol on the back. It looks like a leaf, and something else. I see an 8 (left), something that looks like OCPC, and “875.” At first I was confused, as it looked a bit like gold and possibly had gold symbols on it, but it also looked like it had corroded somewhat. I thought that the dark stuff wouldn’t come off, but just now I tried to scrape it off and it actually came off. There might be a couple spots I still need to wipe down, but overall that’s looking way better, and definitely more like gold. If they are gold, I may just bring them to the jewelers and sell them by weight. I remember as a young lad finding a wedding band at my hometown fair. I picked it up, thinking it was just a toy. However, when I showed my mom later, she recognized that it was in fact a gold ring. We tried to find the owner, using “found” signs in local stores (these were pre-craigslist days), but the owner never showed up and the ring was mine. I held onto it for a while and ended up selling it a year or two ago when my finances were particularly bad (and fortunately the price of gold was particularly good). I made 45$ for what I think was an 18 karat ring. So, what do you guys think? Are these gold? Oh, and what’s that crystal on the second ring made of? Make sure that’s not an old-cut diamond. They’re becoming very popular again, apparently. 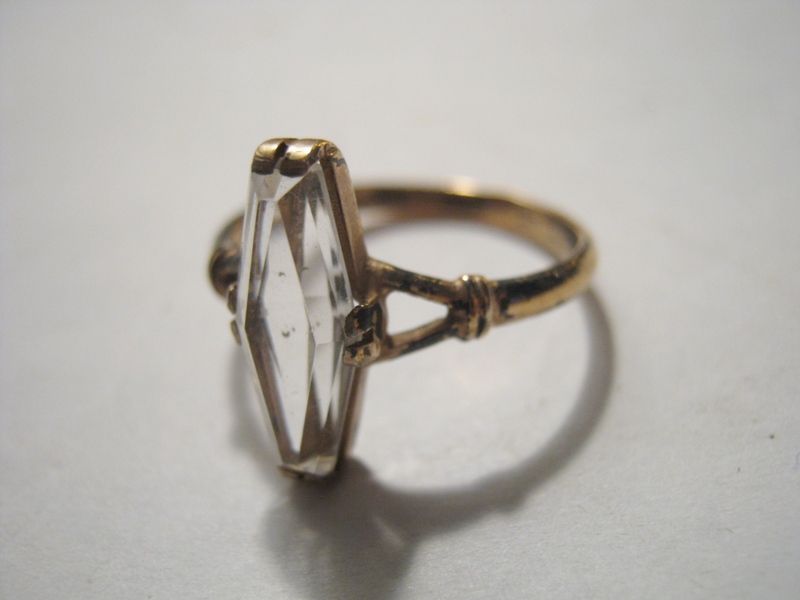 I’m doing some Googling and I don’t see any diamond cuts that look like this one. That’d be nice though! I’m thinking it’s topaz or zircon or colorless sapphire, something like that. Here are some older diamond cuts http://www.pioneerpawn.com/diamonds/cut.htm (plus other useful info). 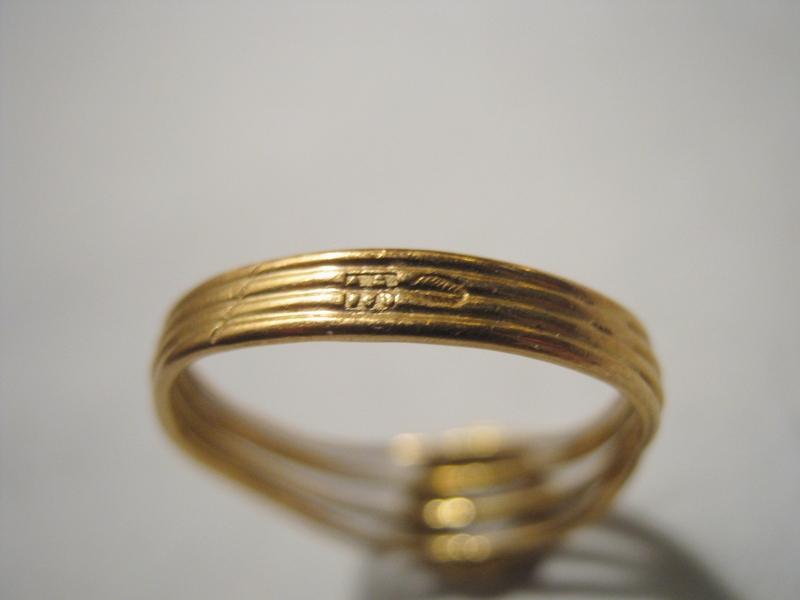 Gold rings alway have stamps indented in them to indicate the purity and to prove that it is soft enough to be real, so both of these appear to be gold. The 875 indicates 21 karats, so it is in remarkable shape for such a soft metal. 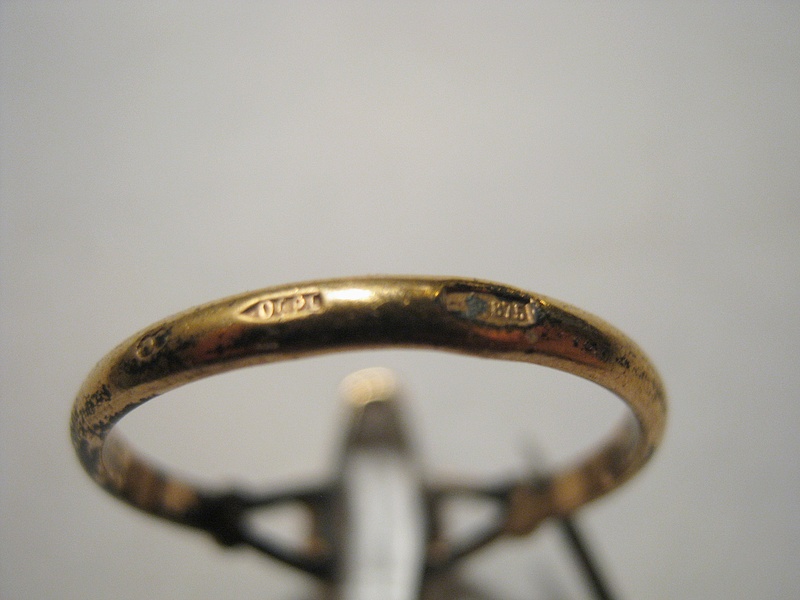 (14k and 18k are more commonly used for jewellery, particularly rings, because even though they are less “pure”, they are less soft and prone to scratches and warping.) The leaf stamp on the first one is likely a jeweller’s insignia, however if there is no number and because it’s more “yellow” I would think it is a 14k piece of costume jewelery. I think the second ring is crystal. 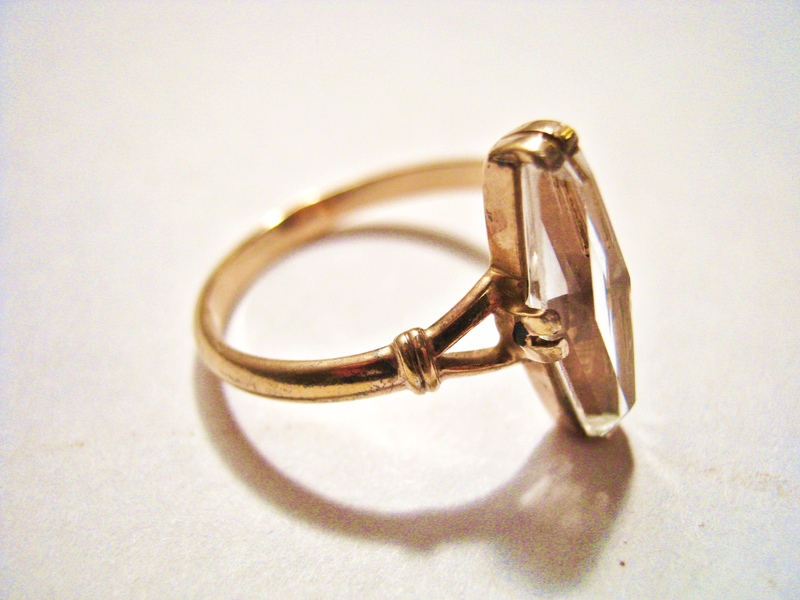 That was very popular in older rings and other jewelry. I wore a crystal necklace at my wedding that was my great great grandmother’s.